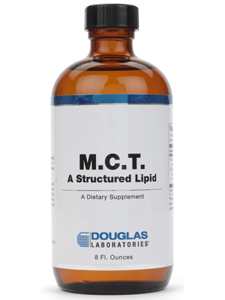 MCT Liquid supplies 100% structured lipids, in the form of medium chain triglycerides in a convenient liquid form. Medium chain fatty acids are healthy fats that may support weight management as part of a healthy diet, or cognitive/memory support. This product contains NO yeast, wheat, gluten, soy protein, milk/dairy, corn, sodium, sugar, starch, artificial coloring, preservatives or flavoring. Suggested Usage: As a dietary supplement, adults take 1 tablespoon daily or as directed by your healthcare professional.